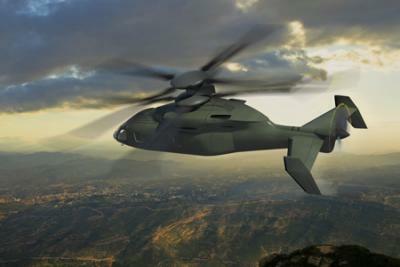 This artist's rendering depicts a Sikorsky-Boeing JMR-FVL concept aircraft with counter-rotating co-axial main rotors and a pusher propeller based on Sikorsky's X2® Technology rotorcraft design. The future rotorcraft will deliver significant improvements in speed, combat radius and hover performance for the Army's next-generation utility and attack helicopter fleets. WASHINGTON, Feb. 28, 2013 -- Sikorsky Aircraft Corp., a subsidiary of United Technologies Corp. [NYSE: UTX], and Boeing [NYSE: BA] will submit a joint proposal to build a demonstrator aircraft -- based on Sikorsky’s X2™ Technology rotorcraft design -- for the U.S. Army's Joint Multi-Role (JMR) Technology Demonstrator (TD) Phase 1 program. This press release contains forward-looking statements concerning opportunities for development, production and sale of helicopters. The opportunities discussed may not lead to actual development or production by the parties due to a number of risks and uncertainties, including but not limited to changes in government procurement priorities and practices, budget plans, availability of funding and in the type and number of aircraft required; decisions to award contracts to competing suppliers; challenges in the design, development, production and support of advanced technologies; as well as other risks and uncertainties, including but not limited to those detailed from time to time in United Technologies Corporation's and The Boeing Company’s Securities and Exchange Commission filings.